1. 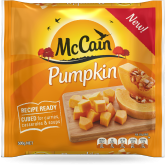 Cook McCain Diced Pumpkin according to packet instructions. Add cooled cooked pumpkin and Moroccan seasoning herbs to blender, blitz until smooth and transfer to a small mixing bowl. 2. Add cashews, parmesan cheese and chilli to the blender, blitz until chunky, similar to large bread crumbs, and add to pumpkin mixture. 3. Crumble feta into pumpkin mixture, add olive oil and white vinegar and gently mix to combine. Serve with veggie sticks and crusty bread. 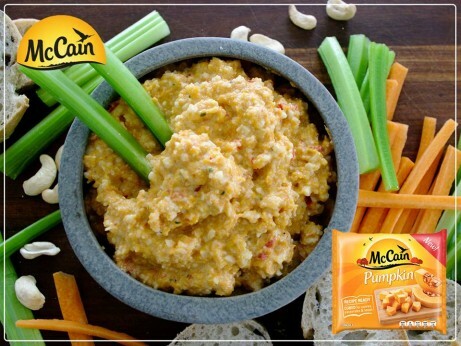 1 Cook McCain Diced Pumpkin according to packet instructions. Add cooled cooked pumpkin and Moroccan seasoning herbs to blender, blitz until smooth and transfer to a small mixing bowl. 2 Add cashews, parmesan cheese and chilli to the blender, blitz until chunky, similar to large bread crumbs, and add to pumpkin mixture. 3 Crumble feta into pumpkin mixture, add olive oil and white vinegar and gently mix to combine. Serve with veggie sticks and crusty bread.